Maybe it also helps her get "Journalist Points" in the eyes of her peers? I simply don't know. I don't know why she does it, shes always done it and that's her thing digging into Nintendo and I shes something like 9/10 times right with what shes says. But how is she finding this out as you bring up Bob about Sun & Moon, we all knew everything before hand pretty much. Unfortunately It's part of gaming now these leaks. I feel like it's to gain one thing & that is a sense of popularity, I've seen a few folk on twitter like this and it's quite annoying to be honest. .....and that's the problem most of us really wish it wasn't for the reasons that Jimbob has already stated. Also I feel the games industry has pretty much encouraged this sort of behaviour since devs are all too eager to show off too much of their game with these "see the first 15/30 minutes of game X" videos. , and none of them knew anything about that and the game isn't out for 12 days either. Also it's not just game as we've seen stuff from the Star Wars Episode 8 set already. I like being surprised by games and by the Nintendo Directs, so I actively try and avoid leaks. People should at the very least be courteous enough to post leaks behind a spoiler wall eg. not posting the leak directly to Twitter such as "METROID PRIME IV WILL BE ANNOUNCED AT E3" and whatnot. I've kept in the dark for Dark Souls III and I'm glad I've done so as the game's properly surprised me at points. People should at the very least be courteous enough to post leaks behind a spoiler wall eg. not posting the leak directly to Twitter such as "METROID PRIME IV WILL BE ANNOUNCED AT E3" and whatnot. Quite right. 'Major news about [whatever]! Click here!' would be so easy to set up. NintendoLife are guilty of this, too - giving away the content of leaks on the sub-heading of the article on the main page. "Have a care, guys," he ranted impotently. HAVE WE LEARNED NOTHING FROM KIRBY'S RUMOUR BUFFET?!?!?! Dam loads at the moment along with a load of Pre-E3 announcement's, the hype is real now. This is why I can't really get excited for E3 these days, the best part of it was always the surprises and very few seem to be left the way it's going this year. YOn leaks about Switch in general it really has taken the buzz out of it for me (believe me I've tried to avoid spoilers) so I can only hope there are some surprises left for January otherwise I fear I may not get it on launch day. ...and I thought I'd give this thread a new name and resurrect it. E3 is a different kettle of fish, and my beliefs haven't changed. It's driven by hype, and hype can be both a good thing and a bad thing: respect is needed for those who enjoy it. However I'm torn on the more general spoiler debate. I hear a rather radical side of it from the Podquisition - Jim Sterling and Laura K. mostly. They effectively say that a journalist's job is to hunt for news, and publishers are trying to maintain their iron-fisted grip on the industry by refusing to let reveals happen before time. There's no subtlety to that point and I can't agree with it. It ignores the point that hype before a reveal can build fun for the reveal itself. While I don't object to the news being discovered, it will then go out onto the Internet and into places that don't care about spoilering news. Every journalist ought to consider the impact of their work, and this is one. ...however, I do respect that a games journalist's work is to find out the truth. Especially when some publishers may want to hold a lot of it back. Investigative journalism exists in all fields of life, no reason it shouldn't do so in games - especially when uncovering shady practices. And when people are deciding over whether to pre-order a system, or a game, then certain details are useful. A linked price is universally beneficial to everyone who matters. Some features, such as sharing, Miiverse, and achievement/trophy implementation, likewise are unexciting but useful. I'd argue that the working names of the launch games are leakworthy too, so long as they don't reveal anything significant (e.g. The Legend of Zelda: Breath of the Wild fine; The Legend of Zelda: Return to Sunken Hyrule perhaps not so much). They're key purchasing information that isn't, on its own, all that exciting. Jas may disagree. I just think it needs to be tempered, that's all. While the publishers shouldn't get it all their own way, there can be downsides for the public in big unofficial reveals. DIGRESSION ALERT: There is no short 'i', as in 'hit', in French. It tends to be pronounced like a long 'e' by French speakers learning English - Le Sweech. I may exclusively refer to it as this in all future podcast appearances. and save the surprise, à la Jas (ooh, I'm on one today!). In all of this I can't help but feel that spoilers are left unmarked by news sites because properly marked ones get fewer hits. I'm bad as anyone for talking about it but I said ages ago in the random thread that Pokemon was a odd one as Nintendo were putting it out them selves to get you hyped for it. MGSV did the same they had a trailer with a Metal Gear in it appearing before stuff on YouTube for instance. This covers it well for me I'm just not a fan of spoilers of any kind - it doesn't matter if it's for TV/films, wrestling or games if I find out something ahead of time it saps the fun/anticipation out of it. Spoilers are thrown around to the point where they just kill discussing anything. At the end of the day a thing existing isn't a spoiler, the plot to something is. If there's a rumor going around that there will be another season of Game of Thrones I won't be upset, if someone blurts out that John Snow is gonna get it on with Cersei in Season 7 then I will. Whether it's Nintendo telling you or a random, it doesn't really matter, the only difference is that if it's from the big N you know 100% it's real. I mostly agree with Andy - I don't like spoilers but people call spoiler on some stupid stuff these days - but I'd say his argument doesn't quite work in the context of Nintendo. A Nintendo Direct is a piece of entertainment I really enjoy watching, and the reveals that tend to happen therein could be considered "the plot" of the Direct. Academically, I agree with Jim Sterling et al. The point of a free press is to provide oversight through transparency, and they shouldn't be kowtowed by the marketing wishes of big companies. On the other hand, all my hatred for corporations and big business goes out the window when it's Nintendo. I love being taken on the hype train! I know it's silly, and makes me a stooge, but I love it. Some of us (no names mentioned) complained about the first official Pokemon Sun and Moon trailer, because they just revealed the names of the new games, which we already knew. But we weren't supposed to know; nor did we until someone leaked it a few days prior. I'm up for journalists finding when a government official has been doing something corrupt; not when they reveal a secret fun surprise from a maker of fun things. Isn't that an issue with Nintendo though? Somebody keeps leaking this stuff despite the fact they must be NDA'd up the wazoo. Shouldn't Nintendo be able to keep on top of that better. Other industries aren't so plagued with leaks are they, so why is this any different? Dude, everything is plagued with leaks. The media are well into it these days, our online world makes it way easier. Remember how much Trump went on about "the emails". It could well be on purpose as before NX/Switch what Nintendo info leaked this much? I think I might be the only person that's excited about said spoiler. I could be, theoretically. Very much depends how it's played, and how 'funny' it is. 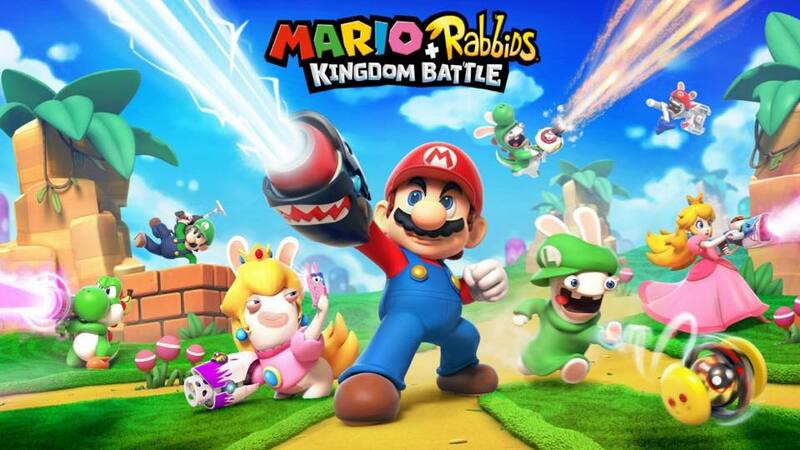 I've never hated the Rabbids, and a Mario X-Com-a-like sounds interesting, but I certainly can't muster up the energy to actually care.